The efficacy of pericardiocentesis in preventing chronic constrictive pericarditis in pericardial effusion (serous/or hemorrhagic) has been inadequately investigated. The problems of perioperative diagnostic error also have not been adequately addressed in the surgical literature despite known difficulties in differentiating patients with restrictive cardiomyopathy from those with constriction.,,, In our study, constrictive pericarditis was considered to be hemodynamically significant when there were clinical features of constriction with supportive echocardiographic and hemodynamic criteria as outlined earlier. Echocardiographically, pericardial thickness of more than 3 mm was generally considered significant. A constrictive pattern was defined as 25% or greater increase in mitral E-velocity with expiration as compared with inspiration and an augmented (25%) or more diagnostic flow reversal in the hepatic vein after the onset of expiration compared with inspiration. Published reports attest to the unpredictable and variable pattern of constrictive pericarditis and lend support to radical decortication. In 2005, for uniformity with other studies, total pericardiectomy was defined as wide excision of the pericardium with the phrenic nerves defining the posterior extent, the great vessels including the intrapericardial portion of superior vena cava and superior vena cava-right atrial junction defining the superior extent, and the diaphragmatic surface, including the inferior vena cava-right atrial junction defining the inferior extent of the pericardial resection. Constricting layers of the epicardium were removed whenever possible. The atria and venae cavae were decorticated as a routine in all cases in this study group. Pericardiectomy was considered partial if both ventricles could not be decorticated completely because of dense myopericardial adhesions or calcification. Radical pericardiectomy would be defined as removal of the entire pericardium over the anterolateral, diaphragmatic surfaces of left ventricle, portion of pericardium posterior to the phrenic nerve and the left ventricle, and the anterior and diaphragmatic surfaces of right ventricle until the atrioventricular groove leaving behind intact left and right phrenic pedicles. Second, the importance of unrecognized constricting epicardial (visceral pericardial) peel was described by Harrington in 1944, and successful pericardiectomy requires decortication of the ventricular epicardium and relief of all constricting layers. In one study, pressure-volume loops were monitored intraoperatively during pericardiectomy for constrictive pericarditis. The intraoperative normalization of the pressure-volume loop was used as an indicator of operative success. Tuberculosis continues to be the leading cause of chronic constrictive pericarditis in developing countries with a reported incidence of 38–83%. Due to the emergence of drug-resistant strains of tuberculosis in association with AIDS, that number is increasing.,, The advent of antitubercular chemotherapy brought down the mortality from tubercular pericarditis from 90% to about 40%.,,, In patients with tubercular pericarditis, our policy is to institute antitubercular chemotherapy for a minimum period of 12 months. Several investigators including ourselves have advocated early pericardiectomy after the clinical symptoms and diagnosis have been confirmed before the occurrence of severe constriction and myocardial atrophy.,,,,,,,,,,,,,,,,,,, In 2005, we attempted to compare two surgical approaches for the treatment of chronic constrictive pericarditis, i.e., median sternotomy and left anterolateral thoracotomy among 395 patients. The surgical approach was primarily based on surgeon preference and remained uniform in our previous study. However, the median sternotomy approach was the preferred option in the following clinical scenario: (1) annular constrictive pericarditis, (2) extracardiac intrapericardial mass, (3) presence of a gradient between the superior and inferior venae cavae and right atrium 2 mmHg or greater, (4) calcific pericardial patch compressing the right atrium and right ventricular outflow tract, (5) constriction after previous open heart surgery, (6) circumferential “cocoon” calcification of the pericardium, and (7) recurrent constrictive pericarditis after partial pericardiectomy. We report our surgical experience with 67 patients who underwent radical pericardiectomy via modified left anterolateral thoracotomy (Group I), and 55 patients who underwent total pericardiectomy via median sternotomy (Group II). In this study, we demonstrated that the maximum benefit for chronic constrictive pericarditis, in particular, is expected from total pericardiectomy, which is best achieved through a median sternotomy and is very difficult if not impossible through a conventional left anterolateral thoracotomy. Patients undergoing creation of a pleuropericardial window for pericardial effusion, pericardial biopsy, and concomitant pericardiectomy with repair of congenital or acquired heart diseases were excluded from this study. In our previous study, we compared the outcomes after total versus partial pericardiectomy. Our study demonstrated that total pericardiectomy was associated with decreased operative mortality (P = 0.02), less postoperative low-output syndrome (P < 0.001), abbreviated hospitalization (P < 0.001), and better long-term survival than partial pericardiectomy (P = 0.004). Ascites, low ejection fraction (0.40 or less), renal dysfunction, hyperbilirubinemia, higher preoperative right atrial pressure (>24 mmHg), atrial fibrillation, pericardial calcification, tricuspid regurgitation and mitral regurgitation, partial pericardiectomy, thoracotomy approach, and postoperative low-output syndrome were significant negative factors for survival according to univariate and multivariate analyses. The risk of death was 4.5 times higher (95% confidence interval [CI]: 2.05–9.75) in patients undergoing partial pericardiectomy as compared to total pericardiectomy. Although the median sternotomy approach allowed a more radical clearance of pericardium overlying the right atrium and venae cavae including the cavoatrial junctions, these areas usually are of little hemodynamic significance in the majority of patients. Furthermore, it is impossible to excise the portion of the pericardium posterior to the phrenic nerve using this approach. 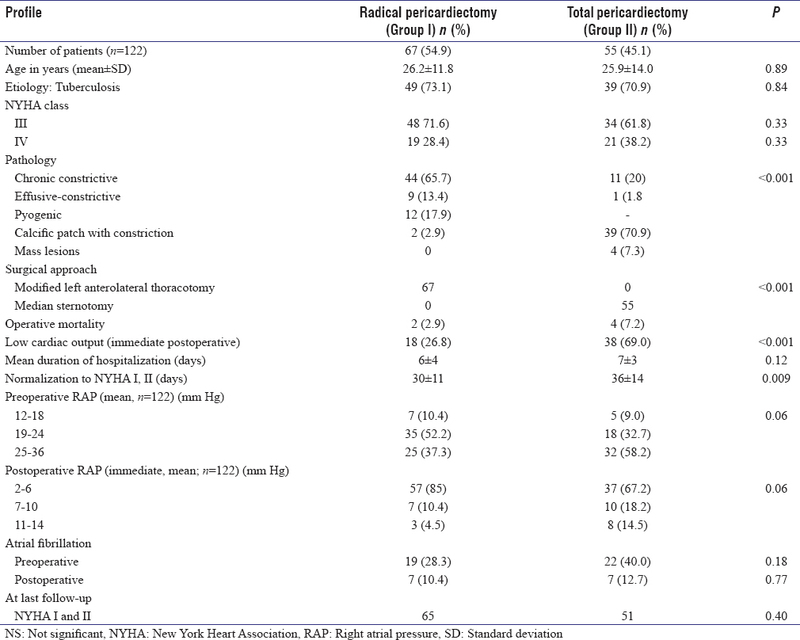 As enunciated above, the median sternotomy approach was the preferred option of the author (UKC) in the selected heterogeneous group of patients undergoing pericardiectomy. To decrease the hospital mortality rates of 7.6% and postoperative low-output syndrome, the author proceeded to perform several technical modifications of the conventional left anterolateral thoracotomy approach to achieve further radical excision of the pericardium posterior to the phrenic nerve and diaphragmatic pericardium. Thus, there were seven forces driving our decision-making for improvement of the results of patients undergoing pericardiectomy via modified anterolateral thoracotomy. The desire to keep both groins prepared at the time of pericardiectomy via modified left anterolateral thoracotomy in case of inadvertent injury to the cardiac chambers and/or great vessels and urgent requirement of the institution of cardiopulmonary bypass. A scapular/deep bladed retractor is used to retract the muscles of the lateral thoracic wall to facilitate undercutting of the intercostal muscles [Figure 1]a. 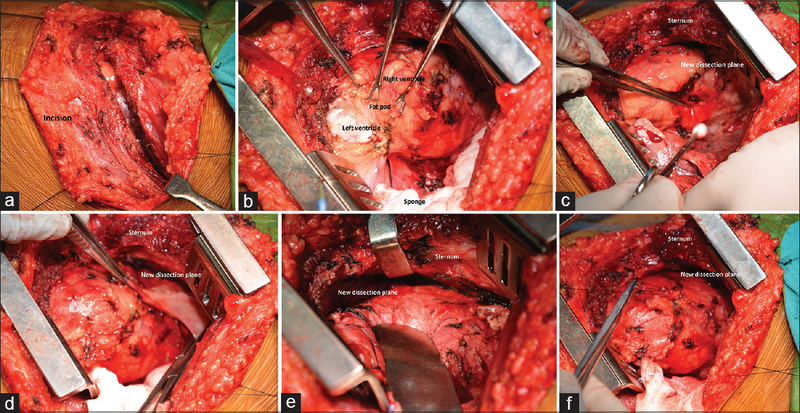 Figure 1: (a) Intraoperative views of the steps of radical pericardiectomy via left modified anterolateral thoracotomy (UKC's modification). The chest is opened through the 4th intercostal space. (b) A large wet sponge is placed over the left lung and retracted posteriorly to facilitate exposure. The excessive fat overlying the left ventricular apex is removed and the left phrenic neurovascular pedicle is identified. (c and d) A new dissection plane is developed between the sternum and the anterior surface of the pericardium. (e) The new dissection plane is extended beyond the midsternum to the right phrenic pedicle. (f) A new cleavage plane is created between the diaphragmatic pericardium and diaphragm. The thymus is routinely dissected off the pericardium to facilitate exposure of the pericardium over the ascending aorta and pulmonary artery. The thymus is excised subtotally, transfixing the superior pole of the thymic gland [Figure 1]b. It is important to retract the posterior table of the sternum using a right-angled deep blade retractor and a new dissection plane is developed using cautery between the sternum and the anterior surface of the pericardium [Figure 1]c and [Figure 1]c.
Three tissue forceps or three No. 1 silk sutures are employed over the anterior portion of the pericardium to facilitate traction thereby extending the newly developed dissection plane beyond the midsternum to the right phrenic pedicle [Figure 1]e.
Using cautery dissection, a new cleavage plane is partially developed between the diaphragmatic pericardium and diaphragm [Figure 1]f.
After exposing the pericardium, two full-length parallel incisions are made using a cautery with low voltage (around 8–10 mV), 0.5 cm anterior and posterior to the left phrenic neurovascular pedicle and extended until the level of the pulmonary artery superiorly and diaphragm inferiorly. Multiple silk stay sutures are placed on the incised pericardial edges anteriorly and posteriorly to achieve exposure and the left phrenic pedicle was thereafter isolated using two vessel loops [Figure 2]a. Figure 2: (a) Two full-length parallel excisions are made using a cautery 0.5 cm anterior and posterior to the left phrenic pedicle and extended up to the pulmonary artery superiorly and diaphragm inferiorly. (b and c) The pericardium posterior to the phrenic nerve is dissected and raised from the posterolateral surface of the left ventricle and left atrial appendage. The midportion of the posterior pericardium is divided at the center into two halves. (d and e) The pericardium anterior the phrenic nerve is subsequently raised from the left ventricle, right ventricle, and pulmonary artery and divided into two halves in between stay sutures to minimize intermittent cardiac compression. The anterior flap is excised 0.5 cm anterior to right phrenic nerve till the pulmonary artery superiorly and the inferior vena cava-right atrial junction inferiorly. (f) Inferiorly, a new cleavage plane is developed between the diaphragm and thickened pericardium and the entire width of the diaphragmatic pericardium is excised in toto. Posteriorly, the pericardium was gently dissected and raised from posterolateral surface of the left ventricle and left atrial appendage. The midportion of the posterior pericardial flap was subsequently divided at the center into two halves to facilitate adequate mobilization until the levels of left-sided pulmonary veins and excised [Figure 2]b and [Figure 2]c.
Anteriorly, the pericardium is dissected until about 0.5 cm anterior to the right phrenic nerve. The anterior flap was thereafter excised till the level of the ascending aorta superiorly and inferior vena cava-right atrial junction inferiorly [Figure 2]d and [Figure 2]e.
Calcific plaques, bars, and circumferential patches of calcified pericardium were divided with a rongeur or a thick hemostat and were removed avoiding injury to the phrenic nerves and the underlying vascular structures. Isolated calcific deposits burrowing deeply into the ventricular muscle may be safely left in situ. Figure 3: (a) Inferiorly, a new cleavage plane is developed between the diaphragm and thickened pericardium and the entire width of the diaphragmatic pericardium is excised in toto. (b and c) Intraoperative pictures of the decorticated heart with an intact phrenic pedicle and the excised pericardium. 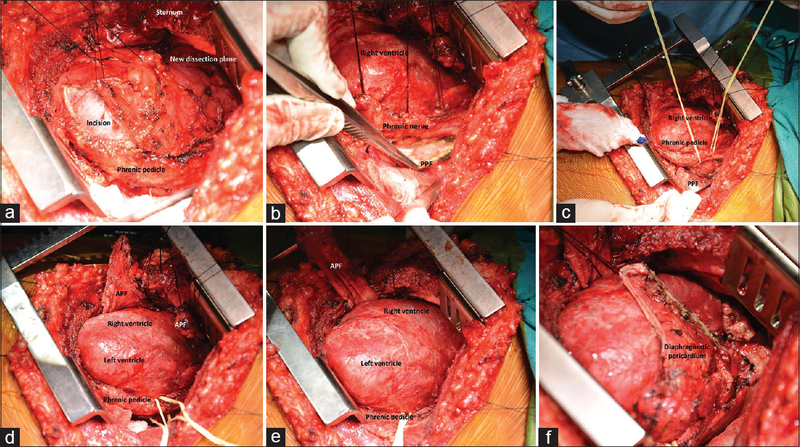 (d) Intraoperative views of the steps of total pericardium via median sternotomy. The chest is opened through the mid-sternotomy incision. (e) Both pleural spaces are entered to visualize both phrenic nerves and to decompress the pleural effusion. (f) An I-shaped incision is made in the midline over the pericardium up to the level of the pulmonary artery superiorly and diaphragm inferiorly. In patients with massive ascites and right or bilateral pleural effusion, it is the author's practice to place an indwelling peritoneal dialysis catheter in the peritoneal cavity before thoracotomy. An intercostal chest drain on the right side of patients with massive right-sided pleural effusion facilitates placement of the patient in left lateral position without compromising with ventilation. An indwelling peritoneal dialysis catheter helps in removal of the third space fluid after completion of the pericardiectomy. This minimizes autotransfusion after the procedure is over, thereby prevents cardiac dilatation and low cardiac output in the perioperative period. The general belief of acute sudden circulatory collapse following sudden decompression of the third space has been unfounded in our experience. The thymus is subtotally excised to expose the pericardium overlying the aorta and pulmonary artery. Subsequently, the thymus and pleural reflection are mobilized laterally to obtain a wide width of pericardium [Figure 3]d.
Both pleural spaces are entered to visualize both phrenic nerves and decompress the pleural effusion if present. It is important to remove the large amount of fat which usually overlies the left ventricular apex in proximity to the left phrenic nerve [Figure 3]e.
The pericardium was inspected and palpated to determine a soft and uncalcified area. An I-shaped incision was made in the midline over the pericardium up to the level of the pulmonary artery superiorly and diaphragm inferiorly [Figure 3]f.
Although some surgeons grasp the edges of the incised pericardium with a Kocher or Alice Clamp, we use multiple silk stay sutures for holding the edges for traction. Retraction of the heart can be done with the left hand using a wet sponge on the heart by the operating surgeon or a sponge forceps held by the assistant. Figure 4: (a) The pericardium overlying the anterior surface of the right ventricle and left ventricular apex is dissected off the heart along with its serous layer with clear visualization of the epicardial fat and coronary arteries. The pericardium is initially divided at the bottom portion closed to the diaphragmatic reflection. (b-d) The anterior pericardial flap is divided into two halves in the middle who facilitate mobilization with minimal intermittent cardiac compression. The left phrenic neurovascular pedicle is identified and a full-length incision is made 0.5 cm anterior to the pedicle which will be the posterior extent of pericardial excision. (e) A plane is developed between the diaphragmatic pericardium and diaphragm in between stay sutures. (f) The pericardium is divided into two halves and dissected off the diaphragm. It is important to remember that the left phrenic pedicle frequently has a more anterior course than expected. Although same centers periodically stimulate the left phrenic nerve with a nerve stimulator, we have not used the same. The left anterior interventricular coronary artery should be well visualized in the operative field [Figure 4]b,[Figure 4]c,[Figure 4]d.
Dissection is done between the pericardium and posterolateral left ventricular wall and along the inferior walls of the left and right ventricles. Posterolaterally, the pericardium posterior to the left phrenic nerve down to the left-sided pulmonary veins is dissected and excised. Generally, there is a greater hemodynamic compromise while removing the diaphragmatic pericardium [Figure 4]e.
Finally, the diaphragmatic pericardium on the right side is dissected off the diaphragm avoiding injury to the dilated and thinned inferior vena cava. The edges of the incised pericardium are treated gently with electrocautery to obtain hemostasis. The pericardial and pleural cavities are irrigated with normal saline [Figure 4]f.
Next, the dissection proceeds laterally on the right side in a similar fashion as we did on the left side. Its important to divide the right pericardial flap in the midportion and surgeon should be more cautions to avoid injury to the right atrium or inferior vena cava/inferior cavoatrial junction. Due to the thinness and dilatation, these structures are more vulnerable to injury during dissection. The pericardial reflection overlying the intra- and extra-pericardial junction of superior vena cava is incised as a routine. The posterior extent of the dissection line is approximately 1 cm anterior to right phrenic nerve [Figure 5]a,[Figure 5]b,[Figure 5]c,[Figure 5]d.
Figure 5: (a and b) The right phrenic neurovascular pedicle is identified and a full-length incision is made 0.5 cm anterior to the right phrenic nerve till the superior cavoatrial junction superiorly and inferior cavoatrial junction inferiorly. The right-sided pericardial flap is divided into two halves and excised freeing the superior and inferior cavoatrial junctions. The surgeon should be more cautious on the right side due to the thinness and dilatation of the right atrium. (c and d) Intraoperative pictures of the decorticated heart and the excised pericardium. Transthoracic two-dimensional, color-flow Doppler echocardiographic studies were performed on all patients before and after the operation. Mitral, tricuspid, superior vena cava, hepatic vein, and pulmonary flow velocities were measured. Mitral or tricuspid regurgitation was assessed semi-quantitatively as Grade 1 + to 4+. Ejection fraction was calculated using modified Quinones method. A constrictive pattern was defined as 25% or greater increase in mitral E-velocity with expiration as compared with inspiration and an augmented (25% or more) diastolic flow reversal in the hepatic vein after the onset of expiration compared with inspiration. Low-output syndrome was diagnosed if the patient required inotropic support dopamine (4–10 µg/kg/min), dobutamine (5–10 µg/kg/min), epinephrine (0.01–0.1 µg/kg/min), milrinone (50 µg/kg intravenous bolus followed by 0.375–0.75 µg/kg/min), either isolated or in combination, in the operating room or intensive care unit to maintain stable hemodynamics in the absence of mechanical external compression after correction of all electrolytes or blood gas abnormalities and after adjusting the preload to its optimal value. Low-output syndrome was also diagnosed if there was an increasing requirement of the above-mentioned inotropes along with afterload reduction with sodium nitroprusside. Patients who received < 4 µg/kg/min of dopamine to increase renal perfusion were not considered to have low-output syndrome. The patients were entered in the study protocol after informed consent had been obtained from patients or guardians. All patients in this study population were operated on a single surgeon (UKC) making uniformity in the surgical protocol possible. One hundred and twenty-two consecutive patients undergoing pericardiectomy for chronic constrictive pericarditis from January 2005 and December 2015 were included in this prospective study; in this study, 67 (54.9%) patients underwent radical pericardiectomy via modified left anterolateral thoracotomy (Group I) and 55 (45.1%) patients underwent total pericardiectomy via median sternotomy (Group II). Their demographic and clinical profiles are depicted in [Table 1]. Patients age at operation ranged from 15 to 58 years (mean ± standard deviation [SD], 31.84 ± 14.62 years). Duration of symptoms ranged from 5 to 60 months (mean ± SD, 17.45 ± 12.9 months). Preoperatively, 82 (67.2%) patients were in NYHA-III and 40 (32.8%) were in NYHA-IV. All patients had CHF as predominant symptom. Eighty-nine (72.9%) patients started to have chest pain, 3 (2.5%) had evidence of cardiac tamponade, and supraventricular arrhythmias were found in 42 (34.4%) patients. Ninety percent had distended jugular veins, 80% ascites, 86% hepatomegaly, 45% pleural effusion, and 30% had pulsus paradoxus. Five out of 122 patients required tapping and steroid therapy for recurrent pericardial effusion. All patients with tuberculosis (n = 88) received multidrug therapy (isoniazid, rifampicin, ethambutol, and pyrazinamide) for 9 months. Before operation, all patients were on digitalis and diuretics. Two (1.6%) patients were diagnosed to have recurrent chronic constrictive pericarditis 5 years after pericardiectomy via left anterolateral thoracotomy done at another center. The etiology was considered tubercular if the histopathology of the excised pericardium showed granulomas, caseation, giant cells (n = 82; 67.2%) or if the fluid and debris removed at surgery were positive for acid-fast bacilli (n = 6; 4.9%) or if gene expert analysis was positive for tuberculosis. A history of pulmonary tuberculosis and lymph node tuberculosis was present in 68 (55.7%) and 9 (7.4%) patients, respectively. The demographic characteristics of both groups of patients did not reach statistical significance. Laboratory investigations showed elevated erythrocyte sedimentation rate (range 40–90 mm at 1 h) in 102 (83.6%), renal dysfunction (serum creatinine > 2 mg/dl) in 41 (33.6%), and hyperbilirubinemia in 35 (28.7%) patients. Chest roentgenogram revealed pericardial calcification in 40 (32.8%), pleural effusion in 40 (32.8%), and pulmonary infiltrates in 13 (10.6%) patients. The calcification was distributed over the anterior and inferior surfaces of the heart in 37 (30.3%) and all around the heart like cocoon in 4 (3.3%) patients. Electrocardiogram demonstrated low voltage QRS complex (n = 86), flattening or T-wave inversion (n = 82), atrial fibrillation (n = 41), and premature ventricular contraction (n = 9). Although these changes were present in the majority of patients, they appeared nonspecific. Echocardiography revealed pericardial thickness (>3 mm, n = 89), inferior vena cava dilatation (n = 97), right atrial enlargement (n = 99), abnormal septal motion (n = 89), >25% increase in mitral inflow velocity with expiration compared with inspiratory phase (n = 97), moderate mitral regurgitation (Grade 2+, n = 21), and moderate tricuspid regurgitation (Grade 2, n = 19). Preoperative cardiac catheterization was performed in eight patients. The rest did not have catheterization either because of their Class IV symptoms with renal dysfunction or the echocardiographic findings were unequivocal. All demonstrated the findings consistent with constrictive pericarditis because of an elevated right atrial pressure, usually with an M- or W-shaped contour, and abnormally high right ventricular end-diastolic pressure with a characteristic dip-plateau diastolic configuration, equalization of end-diastolic pressure in all cardiac chambers, and a ratio of right ventricular end-diastolic to right ventricular systolic pressure of > 0.30. Data were analyzed with SPSS 10.0 statistical package (SPSS, Chicago, Illinois, USA). Continuous and interval-related data are presented as the mean ± SD whereas categorical variables are presented as frequency distribution and percentages. Qualitative data were analyzed by using the Chi-square test or Student's t-test. Mortality rates were calculated depending on the total number of years of follow-up for each patient. Actuarial estimates were calculated using the Kaplan–Meier technique. The log-rank test was performed to analyze statistically difference of survival between patients undergoing radical versus total pericardiectomy. A probability value of 0.05 or less was considered statistically significant. The operative mortalities were 2.9% and 7.2% for the radical and total pericardiectomy groups, respectively. The deaths (n = 6, 4%) were due to intractable low cardiac output (Group I, n = 2; Group II, n = 4) in both groups of patients culminating in hepatorenal syndrome and multisystem failure. Two of these patients also had refractory ventricular arrhythmias. Postoperative echocardiography revealed increased biventricular dimensions, abnormal diastolic filling pattern with raised right atrial pressure. All patients were routinely started on dopamine (4 µg/kg/min) to increase renal perfusion on operation table after completing excision of the thickened pericardium. Patients considered to have low-output syndrome (n = 56) required dopamine (4–10 µg/kg/min), epinephrine (0.01–0.1 µg/kg/min), and milrinone (50 µg/kg intravenous bolus followed by 0.375–0.75 µg/kg/min) either isolated or in combination. Median duration of inotrope requirement was 4 days (range 2–7 days) in these patients. Patients with normal renal function were administered oral angiotensin-converting enzyme (ACE) inhibitors before weaning from inotropic agents. There was marked reduction of filling pressure within 24 h in both groups of patients undergoing radical and total pericardiectomy (95.5% vs. 85.4%, P = 0.06). The degree of reduction of filling pressure and the prevalence of low-output syndrome were significantly different between the groups (P < 0.001). Mean duration of hospitalization was 6 ± 4 and 7 ± 3 days in Groups I and II, respectively (P = 0.12). Echocardiographically, diastolic filling characteristics remained abnormal in 38 (31.1%) patients of the study group in the immediate postoperative period including six patients expired after surgery. At closing interval, 12 (10.3%) survivors continued to have abnormal diastolic filling pattern of Doppler echocardiogram. Postoperatively, digoxin, diuretics, and ACE-inhibitors were weaned at varying time intervals. There were no late deaths. Survivors (n = 116) underwent clinical examination, electrocardiogram, and echocardiogram every 3 months. Follow-up was 100% complete (range, 1–134 months; median 67.5 months) and yielded 687.3 patient-years of data with a mean follow-up time of 67.6 (± standard error 37.4) months. The actuarial survival of the entire study group of patients at a mean follow-up time of 67.6 months was 94% ± 0.02% (95% CI: 88.3 ± 97.2%). At their last follow-up, 111 (95.7%) patients were in NYHA Class I and 5 (4.3%) were in NYHA Class II. The time taken for normalization to Class I/II in Groups I and II was 30 ± 11 and 36 ± 14 days, respectively (P = 0.009). Fourteen (34.1%) of 41 patients who had preoperative atrial fibrillation continued to remain in atrial fibrillation. Surgical techniques did not affect the outcome of atrial fibrillation (P = 0.77). Reoperation was not required for any patient. The radical pericardiectomy was also associated with less postoperative low cardiac output state as compared to patients undergoing total pericardiectomy (P < 0.001). Although there was marked reduction of filling pressure in the postoperative period in both groups of patients, the radical pericardiectomy group demonstrated greater degree of postoperative reduction of right atrial filling pressure as compared to total pericardiectomy group. There was no difference in mean duration of hospitalization; however, the radical pericardiectomy group achieved NYHA-I and II status quicker than total pericardiectomy group (P = 0.009). Normalization of cardiac hemodynamics in patients undergoing radical pericardiectomy may be the possible reason for shorter interval to attain NYHA-I and II status. Since thoracotomy was the preferred option in patients with purulent pericarditis and median sternotomy was the preferred option in the setting of calcific pericarditis, calcific pericardial cocoon, and pericardial masses; inclusion of all patients for study comparison may be an important bias of the study. Studies are underway to compare the clinical and hemodynamic outcome of patients undergoing radical pericardiectomy via modified left anterolateral thoracotomy and total pericardiectomy via median sternotomy on a larger number of patients with different etiologies. 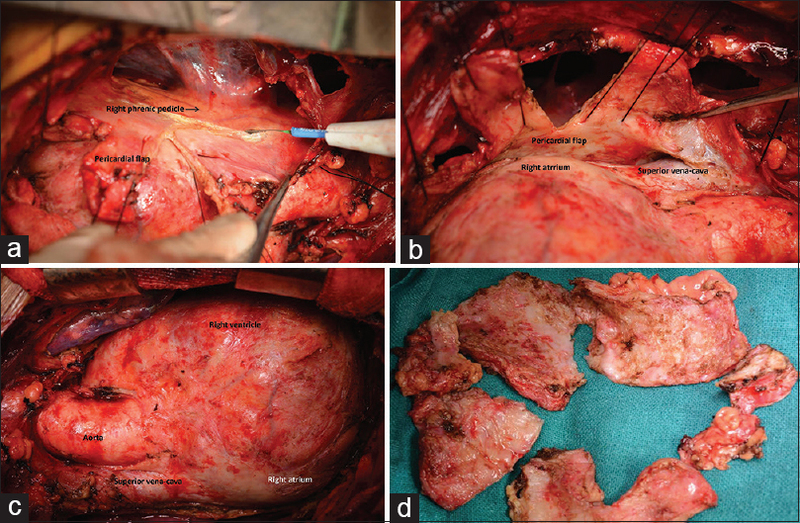 We conclude that using several technical modifications of pericardial excision as enumerated above, it is possible to achieve radical pericardiectomy via modified left anterolateral thoracotomy, particularly removing the constricting pericardium over the anterolateral, diaphragmatic surfaces of left ventricle and the anterior and diaphragmatic surfaces of the right ventricle until the right atrioventricular groove. Although the surgical approach for pericardiectomy is based on surgeon preference, left anterolateral thoracotomy is the preferred and noncontroversial approach in the setting of purulent pericarditis and effusive constrictive pericarditis to prevent sternal infection. We would recommend median sternotomy approach with or without cardiopulmonary bypass for total pericardiectomy in the setting of calcific pericardial patches, pericardial masses, reoperations, and calcific pericardial “cocoon” and for those with predominant right-sided and annular involvement. White PD. Chronic constrictive pericarditis (Pick's disease) treated by pericardial resection. Lancet 1935;2:539-48,597-603. Churchill ED. Decortication of the heart (Delorme) for adhesive pericarditis. Arch Surg 1929;19:1457-69. Harrington SW. Chronic constrictive pericarditis: Partial pericardiectomy and epicardiolysis in twenty-four cases. Ann Surg 1944;120:468-85. Ling LH, Oh JK, Tei C, Click RL, Breen JF, Seward JB, et al. Pericardial thickness measured with transesophageal echocardiography: Feasibility and potential clinical usefulness. J Am Coll Cardiol 1997;29:1317-23. Faber L, Prinz C, Welge D, Hering D, Butz T, Oldenburg O, et al. Peak systolic longitudinal strain of the lateral left ventricular wall improves after septal ablation for symptomatic hypertrophic obstructive cardiomyopathy: A follow-up study using speckle tracking echocardiography. Int J Cardiovasc Imaging 2011;27:325-33. Pedreira Pérez M, Virgós Lamela A, Crespo Mancebo FJ, Cervantes JL, Fernández de la Reguera G, Barragán García R. 40 years' experience in the surgical treatment of constrictive pericarditis. Arch Inst Cardiol Me×1987;57:363-73. Raffa H, Mosieri J. Constrictive pericarditis in Saudi Arabia. East Afr Med J 1990;67:609-13. Bashi VV, John S, Ravikumar E, Jairaj PS, Shyamsunder K, Krishnaswami S. Early and late results of pericardiectomy in 118 cases of constrictive pericarditis. Thora×1988;43:637-41. DeValeria PA, Baumgartner WA, Casale AS, Greene PS, Cameron DE, Gardner TJ, et al. Current indications, risks, and outcome after pericardiectomy. Ann Thorac Surg 1991;52:219-24. Hakim JG, Ternouth I, Mushangi E, Siziya S, Robertson V, Malin A. Double blind randomised placebo controlled trial of adjunctive prednisolone in the treatment of effusive tuberculous pericarditis in HIV seropositive patients. Heart 2000;84:183-8. Myers RB, Spodick DH. Constrictive pericarditis: Clinical and pathophysiologic characteristics. Am Heart J 1999;138(2 Pt 1):219-32. Suwan PK, Potjalongsilp S. Predictors of constrictive pericarditis after tuberculous pericarditis. Br Heart J 1995;73:187-9. Astudillo R, Ivert T. Late results after pericardectomy for constrictive pericarditis via left thoracotomy. Scand J Thorac Cardiovasc Surg 1989;23:115-9. Culliford AT, Lipton M, Spencer FC. Operation for chronic constrictive pericarditis: Do the surgical approach and degree of pericardial resection influence the outcome significantly? Ann Thorac Surg 1980;29:146-52. Copeland JG, Stinson EB, Griepp RB, Shumway NE. Surgical treatment of chronic constrictive pericarditis using cardiopulmonary bypass. J Thorac Cardiovasc Surg 1975;69:236-8. Saidi F, Scannell JG. Re-operation for constrictive pericarditis after a long period of clinical remission. J Thorac Cardiovasc Surg 1962;43:615-21. Strang JI, Kakaza HH, Gibson DG, Girling DJ, Nunn AJ, Fox W. Controlled trial of prednisolone as adjuvant in treatment of tuberculous constrictive pericarditis in Transkei. Lancet 1987;2:1418-22. Ntsekhe M, Wiysonge C, Volmink JA, Commerford PJ, Mayosi BM. Adjuvant corticosteroids for tuberculous pericarditis: Promising, but not proven. QJM 2003;96:593-9. Strang JI, Nunn AJ, Johnson DA, Casbard A, Gibson DG, Girling DJ. Management of tuberculous constrictive pericarditis and tuberculous pericardial effusion in Transkei: Results at 10 years follow-up. QJM 2004;97:525-35. Mercé J, Sagristà-Sauleda J, Permanyer-Miralda G, Soler-Soler J. Should pericardial drainage be performed routinely in patients who have a large pericardial effusion without tamponade? Am J Med 1998;105:106-9. Vaitkus PT, Kussmaul WG. Constrictive pericarditis versus restrictive cardiomyopathy: A reappraisal and update of diagnostic criteria. Am Heart J 1991;122:1431-41. Gerson MC, Colthar MS, Fowler NO. Differentiation of constrictive pericarditis and restrictive cardiomyopathy by radionuclide ventriculography. Am Heart J 1989;118:114-20. Aroney CN, Ruddy TD, Dighero H, Fifer MA, Boucher CA, Palacios IF. Differentiation of restrictive cardiomyopathy from pericardial constriction: Assessment of diastolic function by radionuclide angiography. J Am Coll Cardiol 1989;13:1007-14. Kubota T, Kawasaki M, Takasugi N, Takeyama U, Ishihara Y, Okubo M, et al. Evaluation of left atrial degeneration for the prediction of atrial fibrillation: Usefulness of integrated backscatter transesophageal echocardiography. JACC Cardiovasc Imaging 2009;2:1039-47. Bozbuga N, Erentug V, Eren E, Erdogan HB, Kirali K, Antal A, et al. Pericardiectomy for chronic constrictive tuberculous pericarditis: Risks and predictors of survival. Tex Heart Inst J 2003;30:180-5. Afzal A, Keohane M, Keeley E, Borzak S, Callender CW, Iannuzzi M. Myocarditis and pericarditis with tamponade associated with disseminated tuberculosis. Can J Cardiol 2000;16:519-21. Chowdhury UK, Seth S, Reddy SM. Pericardiectomy for chronic constrictive pericarditis. J Oper Tech Thorac Cardiovasc Surg 2008;13:14-25.